The following post was submitted by Educator Innovator partner Imagination Foundation, and is one educator’s reflection on the experience of her school’s participation in the Global Cardboard Challenge, a worldwide celebration of imagination. This past Friday afternoon might just have been one of my favorite moments ever in my life as a teacher. 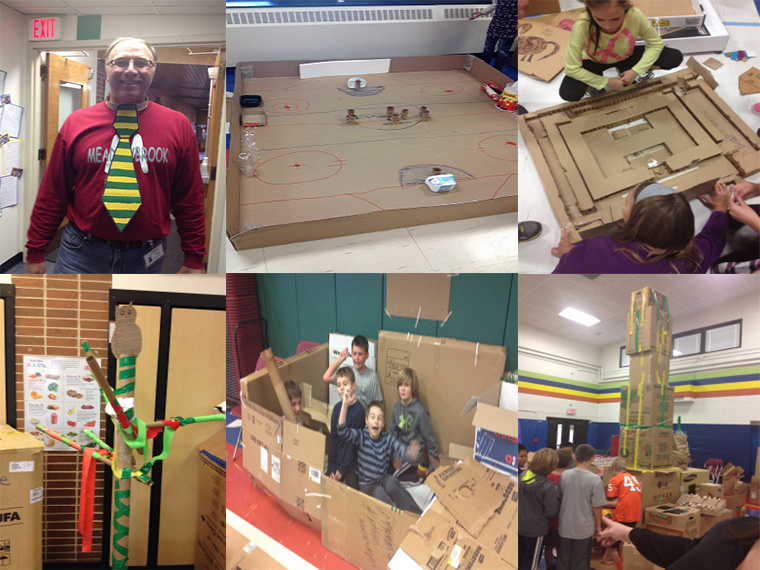 This past Friday afternoon, my whole school joined together to take on the Global Cardboard Challenge. The results were beyond what any of us expected. The whole project began just a few weeks ago. I had seen the Cardboard Challenge continuously pop up on Twitter throughout the month of August and September. As the school year began to settle in and I began to more fully embrace the idea of trying new things in my classroom that would empower my students, I decided to check out the Cardboard Challenge more closely. It didn’t take long before I was sold on the idea. And then I found myself in an interesting position. Here I was, looking at this incredible idea, an idea that I knew the kids would love and one that I knew would help teach my students learn the very things that I wanted them to start to learn: the importance of creativity, the challenge of following your own ideas, the power of trying something new, and the genius that they each posses. I was looking at this incredible idea and I had to decide what to do with it. The easy thing, the safe thing, would be to do the cardboard challenge in my own classroom. I wouldn’t need to ask anyone’s permission. I could do the challenge the way I wanted to, without having to worry about any one else’s ideas. If the whole thing was a huge flop, no one would hold me responsible, other than my students, who would have loved the chance to watch their teacher try and fail. And, though I hate having to admit that these kinds of thoughts ever enter into my own head, if I did this great thing only in my own classroom, then I would get to be the teacher doing the really great thing in her own classroom. Yep. While I am not proud of it, there was the thought that I had found this idea, I was willing to give it a try, and I should be the one to get the glory. Luckily, I didn’t stay in that place for very long. I quickly began to imagine what could be possible if our entire school took part in the Global Cardboard Challenge together. I began to imagine the power of taking an entire afternoon to watch the entire school come together in order to follow the kids’ lead and in order to show the kids that we value creativity and innovation. So I went to my principal, who, if I have not yet mentioned, is an incredible human being and an incredible educator whose mind is always, always, always focused on the students first. I shared the idea and the Cardboard Challenge website with him and he quickly grew to love the idea. He suggested that I present the idea to the staff at our next staff meeting and see what they all had to say. Well, that was pretty terrifying. It wasn’t that I minded speaking in front of my staff, it was the idea of making myself vulnerable, in suggesting a possibility that I wasn’t certain would be a success, in asking my fellow teachers to trust me and to trust our kids and to try something that is far outside of the comfort zone for most of us. I knew there would be teachers who would be hesitant. I knew there would be questions that I could not yet answer. I knew there would be concerns that would not be soothed by an inspiring video and a promise that the kids would love this. But I so believed in the project and in what I had seen my own students do when given the opportunity to be creative and to follow their own ideas, that I agreed to present. And so I did. And most people loved the idea. And a few people hated it. And I tried really hard to focus on the good. And so we went ahead with the idea, there were incredible people who stood up to help. There was excitement in the air. There was cardboard filling our hallways. And on Friday afternoon, you could almost feel the creativity in the air. Our afternoon began with two kick-off assemblies. Each assembly was made up of a mixture of grade levels. Each group of students saw an incredible presentation by our literacy coach where she reenacted the storyline of the picture book This is Not a Box and then they watched a group of 5th grade students demonstrate how they might build something from cardboard and tape. And finally, they heard our principal explain the project, why we were doing it and how the afternoon would run. He explained that we would be working together, as a school, to build our community out of cardboard. Each student would choose to work alone or with a group to build something that could be found in our own community. And by the end of the day, each cardboard creation would be brought to one of our two gyms and combined to build our town. And then the kids were dismissed from the assemblies and the building began. And that is when I started to realize how amazing this afternoon really was. One co-worker, who also has a child who goes to our school, stopped to tell me that usually waking up her son is a terrible ordeal. He never wants to get out of bed. But on Friday morning, she walked into his bedroom, reminded him that it was Cardboard Challenge Day and he popped right out of bed and was ready for school in fifteen minutes. As I walked around the school to watch all of the classrooms who were busy building, I didn’t see a single child who was out of control, there was not a single behavior problem to be solved and there was not a single child who was unmotivated to build something out of cardboard. It was amazing. As I think back on it now, I still can’t believe what I saw. It was so incredible to see the kids creating, to see the kids taking risks, to see the kids working together seamlessly. I think we all felt in awe of the kids. I think we all realized that this is how we wish our school looked all the time. And true, perhaps we aren’t able to figure out just how to bring this kind of excitement to our students every minute of every day, but I think that we at least realized that we need to work a whole lot harder in order to bring these kinds of experiences to our students. These experiences that honor and value more than one set of strengths. These experiences that allow the students to lead. These experiences that allow opportunities for our students to work together in order to create and not just consume. These experiences that bring energy and passion and excitement into the classroom instead of just ask our students to sit down and be quiet. These experiences that make kids want to come to school and want to stay at school. As you can see, the day was a success. I was so glad that I allowed this activity to exist outside of just my classroom because the benefits were enormous. Feeling the power of the whole school coming together for one activity was no small thing. When we return to school, when the hallways are free from cardboard, I believe that this experience will stay with all of us. I know that for me, this experience has motivated me to look for more ways to get my students following their own ideas, their own passions, their own creative spirits. It has reaffirmed my desire to teach in a way that allows the students to lead. It has reminded me of what these kids are capable of when we just stop, step aside and watch them go.